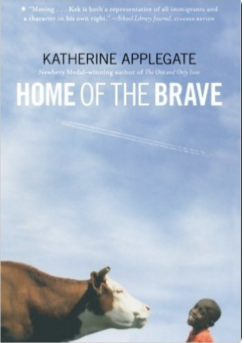 We had a snow day on Friday, and I spent the first part of it reading Home of the Brave by Katherine Applegate. 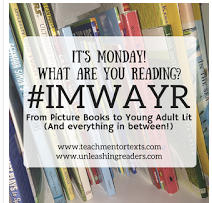 This one has been on my TBR list for a while, as many bloggers and other teachers have talked about it, and it was decadent to sit and read it cover to cover. If you haven't read this one yet, I highly recommend it. I started it with the idea that I'd pick up craft moves--I had a pencil in hand and a pad of sticky notes. Within about twenty pages, the plot swept me away. I'll have to go back on a rereading mission in order to mark some pages as mentor text possibilities because I was far too interested in Kek's story to want to take time writing in or about the text! While this story inspired me to learn more about Sudanese refugees since the main character is a ten year-old refugee and the story opens with him landing in Minnesota to live with relatives, it's also a universal story of friendship, making mistakes, and overcoming adversity. Told in verse, it would be a wonderful read aloud, as well as an important story for book clubs and conversations. Definitely one of my favorites! Glad you finally got to read it. I have it from the library waiting, Melanie, and it's because of Ramona (above) that I do have it. What fun. I am going to read it! I remember reading this title quite quickly too. I really found it powerful. I ordered it and could read a sample, but not nearly enough. Can't wait to get the whole thing. Thanks! I liked this one quite a lot. We're doing One and Only Ivan in my Children's Lit class this week and know many students will want to follow that up with Home of the Brave. Sadly, all 4 of the copies I bought have disappeared! Will have to repurchase. Sigh! !